Mustang Rolling: Pedro sez, "Chili tonight, but uncertain Tamale"
Our arrival at Hamer, SC, in search of the bottling plant for legendary Blenheim Ginger Ale was disappointing and strange. We found an unremarkable concrete block structure behind which was a labyrinth of piping and a very large tank marked "CO2". So much for natural carbonation. The front of the place has two resin or plastic eagles pitched and perched on pipe legs at either side of the door. It is sequestered down a short dirt road from a gate beyond which visitors were not allowed. The gate had been left open. The unadorned grounds are used as random storage for rusted implements. The plant sits on land used for other things. If you removed some of the modern junk and scattered a few 1956 Chevys around, it could pass for Cuba. This is neither the original plant nor ownership. We got a different story from each of the several people we asked about the place none of whom we will quote. It did not fit our expectations or the projected image of the product. Hamer, we found, was right in the middle of the famous tourist attraction, South of the Border. On that account it did not seem like a wasted trip. We quickly fell under the spell of Pedro's sombrero. 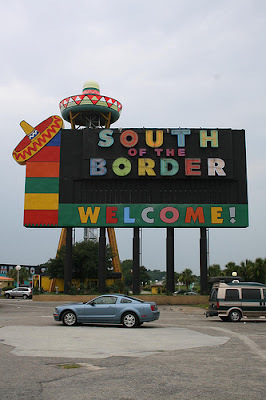 South of the Border or "SOB" (black letters painted on a large YELLOW elevated water tank) for short, was born of the inventive talents of the late Alan Schafer more than 50 years ago. Schafer legally sold beer at his store just inches within the South Carolina side of the state line. Inches north was dry Robeson County, North Carolina, the citizens of which were only too happy to step over the line for good cold beer. So, we drove four hours looking for a ginger ale plant and wound up at a beer joint turned tourist trap empire. At the beginning Schafer began importing trinkets from Mexico to enrich his South of the Border motif. He must have learned early on that bad taste can be bankable and that ethnic funmaking is fully acceptable as long as it's at the expense of the right ethnicity. Perhaps he saw that comic images of certain folks eating watermelons and picking cotton was causing considerable ill will and sharply diminishing revenue for traditional roadside stands. In a few years the Frito Bandito would be drawing belly laughs with TV viewers and selling corn chips by the carload. Unlike Frito-Lay, however, Schafer didn't roll over when joshing the Mexicans became a raised issue. In spite of brewing demands to sanitize that image including an undocumented protest from the Mexican Embassy, Schafer pulled only a few of the more exaggerated Mexicanisms from his billboards, but then put them all in a colorful booklets which he sold quite successfully to customers in his gift shops. He gave up nothing while making a bit more money in the process. He possessed the instincts of the pure promoter unfettered by distractions. We prowled around the compound checking out the amusements, following a Zebra, looking at the people seeking relief from the monotony of Interstate 95. Upon closer inspection we found that several buildings were still "Closed for the Winter". An adjacent motel promoted their "Winter Rates" of $33.95. One could still pay for a ride in an elevator up to Pedro's sombrero, but we saw the majority of visitors lined up at the restrooms. Pedro's Concrete Gallery was also closed, but we peeked in to find nothing more than an assortment of dreadful cement statuary of the type seen in the yards from hell along our way. Two gargantuan concrete Pedros are posted at the gallery entrance. They seem more the creatures of Diablo than Disney. In any respectable horror movie they'd come alive and turn the tourists to stone in revenge for the many gags at Mexican expense or just eat them when the cement tacos ran out. With an endless supply of bored motorists informed of Pedro's charms by a dense series of signs many miles up the road, things are slow. The gaudy nature of the place was the bulk of its charm, but things now look worn and tired. It presents as a small town in decline. Shafer may have stored tumbleweed somewhere for the final phase of SOB. He could turned the demise of SOB into a profit. What we saw looked like the figurative winter in the middle of July for Alan Schafer's once joyfully gaudy empire of fun. Mr. Schafer died in 1991 and Pedro, while not on life support, is just a little short of wind and a bit long in the tooth. I stopped there over a year ago just because I never had done so before. It was a depressing sight. There are nearby skin joints and everything looks like trash. I think that it would make a nice park if the state of SC would buy the property, tear down the junk and landscape it. Hey thanks. I was vaguely aware of the place but now you have saved me the time I would have spent stopping. The last time I passed it was 2 years ago during my 30-day Amtrak rail pass adventure. I saw the sombrero sign from the tracks as we rolled past on our way up to Washington,DC and beyond. Right you are, Syd, decay has set in at "SOB". Even the skin joints couldn't make a go of it so their seedy buildings are abandoned. The land is too valuable for the state to buy and it appears that the heirs plan to take what profit they can without improving the place. Once it finally fails and Pedro is carted to the land fill, expect a major chain motel at best. Thanks for stopping by...here, that is. Chuck, we're glad you didn't jump the train at "SOB". You'd have been wiser to dig in at the club car and dispatch Tequila shots toasting Pedro as you passed. Our old buddy, the "Country Lawyer", says that it began as a hotdog stand selling beer and will decline back to the same in a few years. Were it not for the land value that might be true given their management skills. Our pictures showed the best of SOB. It gets worse when you look around. Us kids would start counting SOB signs along US 301 and later I 95 on the family's annual summer trip to Pittsburgh during the 60s and earlier. The numerous signs worked as designed as we would stop, use the restrooms and spend a few bills while wandering around the gift shop. Never rode any of the funky rides as Dad didn't want to stay too long, our visit was usually at night and anyway we would be spending a day riding much better rides at Kennywood Park outside of Pittsburgh. Too bad the place has fallen on bad times. Thanks, ANON, for your comments. We can well imagine that your father didn't want his children getting too attached to the SOB facility. The more we think about our visit, the stranger it all seems. You should visit again. The place looks great and business is good. Two movies have recently filmed here and HBO is filming here tomorrow. Things are looking up in PedroLand!! Thanks very much for your comment. There was a local newspaper article on South of the Border this week. It seem that it continues to hold the interest of tourists and long time fans of Pedro. We wish you the very best of continued success. I see those South of the Border bumper stickers all the time here in the DC Metro area. The couple of times that I have been there I have been disappointed. It's kinda crappy. Yet, glorious in it's tackiness. As a child on our yearly sojourns to Pawleys Island in the summer, my father went to great lengths to avoid driving past this place, hence stirring up a trio of "let's stop"s.
Years later, I did finally stop in Pedro's "cafe" on the way back home from the beach for breakfast. The joint was deserted, and stunk of old beer. A hasty departure ensued, with breakfast found a little ways down the road. It's a great kitchy road attraction, but there's really no good reason to stop. Keep an eye out for entranced visitors crossing the road, even though Pedro supplies an overhead bridge. I almost ran over a group there one time.